The Ford Wildlife Foundation (FWF) expanded its support for environmental conservation efforts through the donation of a Ford Ranger to the Namibia Nature Foundation (NNF). The South African-built Ford Ranger will be used by the organisation to assist two community nature conservancies with concessions in Khaudum National Park. Located in north-eastern Kavango Region, the park, which is within the KAZA Transboundary Conservation Area, is home to elephants, African wild dogs, rare sable antelope and over 320 species of birds. “For the past 30 years, Ford Motor Company of Southern Africa (FMCSA) has been actively involved in the conservation of wildlife and ecosystems, with approximately R40-million invested in supporting more than 170 conservation projects across the region,” said Lynda du Plessis, Ford Wildlife Foundation Manager. “We are delighted to add the Namibia Nature Foundation to our list of partners, and are encouraged by the exceptional work it is doing to promote environmental sustainability, along with community participation in their conservation projects.” The NNF is Namibia’s leading non-governmental organisation promoting sustainable development, the conservation of biological diversity and natural ecosystems, and the wise and ethical use of natural resources. 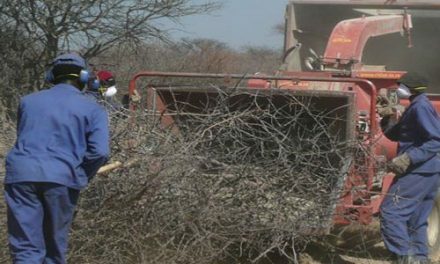 Since 2010, the NNF has been working with Namibia’s Ministry of Environment and Tourism and the Ministry of Agriculture Water and Forestry in the George Mukoya and Muduva Nyangana conservancies, providing institutional support, natural resource management and biodiversity conservation, as well as enterprise development to provide direct benefits to the local communities. “Nature Conservation is tough! It is often about tough choices that have to be made by people, living in tough places, and the people living and working in the Khaudum North Complex are no exception,” said Edla Kaveru the NNF Operations Director. “We are delighted to receive the ‘Built Ford Tough’ Ranger from the Ford Wildlife Foundation, as it is perfectly suited to the challenging terrain in this remote and rugged part of the Kalahari basin. This vehicle will play a crucial role in maintaining our ongoing support to the communities in Khaudum, allowing us to be more efficient in responding to the needs of the community and helping them drive their own pro-conservation agenda,” she added. Through its long-term collaboration, the NNF has partnered with the conservancies to help them become functional, providing advisory support on implementing good governance procedures and drafting of their management plans – such as the forest management plan for the Muduva Nyangana conservancy. “Today both conservancies operate joint management activities with Khaudum National Park staff and, most importantly, are making an income from and are active partners in conservation,” stated Kaveru.